Jennifer Stovall was more curious than anything else. A retired airline worker from Towaco, NJ, Stovall wanted to be among the very first to enter the new FanDuel Sports Book at the Meadowlands Racetrack, so she got to the track 45 minutes before the scheduled 11:00 a.m. opening to the general public Saturday morning. Little did Stovall know was that she would be among the very first to place a legal sports bet in northern New Jersey. The FanDuel Sportsbook will feature bets on all professional major sports, including baseball, football, soccer, basketball, golf, boxing, and motorsports. 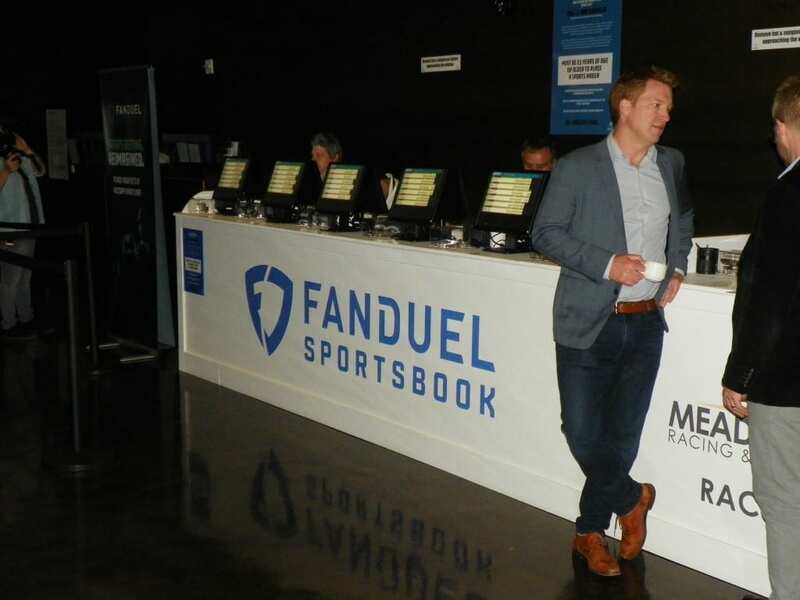 There are currently 10 teller windows and 27 televisions, but by the start of the football season, the FanDuel Sportsbook will expand to 15 betting windows and 65 television screens of all sizes. “We believe this will be the premier sports betting experience for fans in New Jersey, New York and across the northeast region,” said Matt King, the CEO of FanDuel, a fantasy sports company. 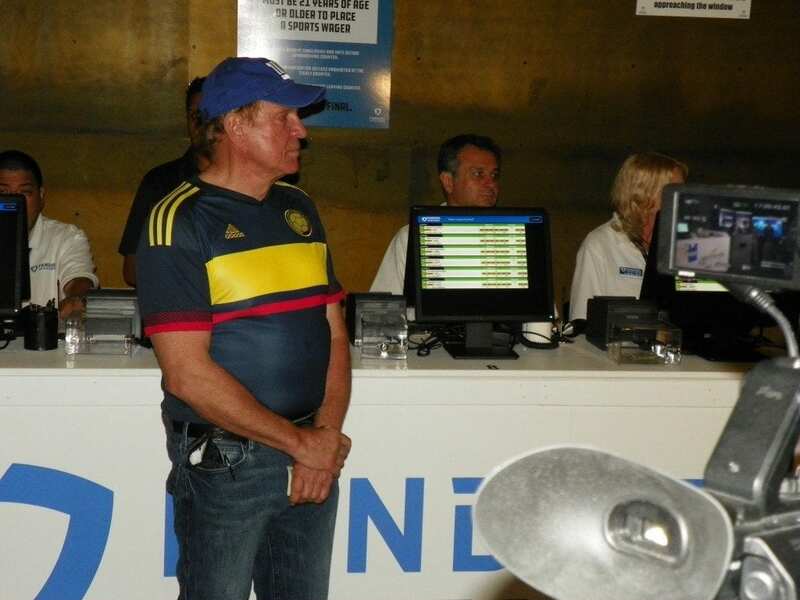 The first bet at the new sports wagering facility was actually placed by former New Jersey State Sen. Raymond Lesniak, who was also one of the first to make a bet at Monmouth Park’s William Hill sports book a few weeks ago. Lesniak was one of the biggest supporters in the New Jersey state legislature of legalizing sports gambling in the state. Lesniak bet on France to win the World Cup at Monmouth Park, so he “double downed” on France again Saturday at the Meadowlands, which turned out to be a smart move. Lesniak also enhanced his wager on the New York Giants to win the Super Bowl in February; that one may be less profitable. Lesniak attended Saturday’s grand opening wearing a Giants cap and a Colombian soccer jersey, but his money is on France in the World Cup finale. Former New Jersey Governor Richard Codey, a longtime supporter of horse racing in the state, was also on hand for Saturday’s historic opening. Codey never truly believed that there would be a day where sports wagering would be legal in the Garden State. Dennis Drazin, the president of the New Jersey Thoroughbred Horsemen’s Association and the chief executive officer at Monmouth Park, was also on hand to lend his support to the cause. Drazin was the one who led the charge to change the laws to allow sports wagering in the state. Former NJ State Sen. Ray Lesniak. Photo by Jim Hague. Drazin said that the first day of legalized gambling in New Jersey, Monmouth Park saw an increase in attendance of over 1,000. That’s good news to Drazin’s good friend Jeff Gural, who owns and operates the Meadowlands Racetrack, which houses the state’s premier Standardbred racing facility and now houses the lone legalized sportsbook in northern New Jersey. Gural said that he’s in negotiations with the Giants and Jets who occupy the adjacent MetLife Stadium for home games so that his facility could be open on Sundays when the NFL is playing. As it stands now, the National Football League is hoping to maintain its strict policy against sports wagering and will more than likely prohibit the opening on game days. Gural was enjoying a big day, because later Saturday night, one of the jewels of the harness racing season, the Meadowlands Pace, was scheduled to race. Both Gural and Drazin admit that sports betting will help horse racing in New Jersey, but that the state legislature has to return the subsidies it used to provide the industry in order to truly help purses and the amount of racing days both the thoroughbred and standardbred racing need. Codey said that there is a plan in place to provide $31 million in subsidies to the horse racing industry. 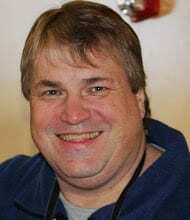 As long as fans like Stovall keep returning, after the curiosity wanes. Robert Halsey, a truck driver/operator from nearby Moonachie, echoed those sentiments. On another note, Drazin expressed disappointment that Justify, the recent winner of horse racing’s Triple Crown, would not run in Monmouth Park’s upcoming Grade 1, $1 million Betfair.com Haskell Invitational. Justify has experienced ankle swelling and will be kept off the track for the next two weeks, eliminating the chance of racing at the Haskell.